Aquarium filters are very simple devices, yet something marvelously complex happens inside them. Entire colonies of microscopic bacteria live inside the filter of a properly-cycled and maintained aquatic tank, tirelessly working to keep the water clean and safe. Very few people who are new to the aquarium hobbies fully understand and appreciate what goes on inside a filter and why it's so important to maintaining a healthy environment for their aquatic pets. They think that the filter's only job is simply to remove solid particles from the water, like a coffee filter does. The more deeply they get into the hobby, however, the more they realize that removing particulate matter is perhaps the least important thing that an aquarium filter does. Let's take a look at aquarium filters, what they do, how they work, and why these simple canisters are so important to maintaining a healthy environment for our frogs. What Does an Aquarium Filter do? Mechanical filtration is what most people think of when they hear the word "filtration." It's the removal of solid and semi-solid particles from the water by straining it through the filter media, which may be screens, special sponges, poly fill floss, fiber pads, or some combination of those. In multi-stage filters, mechanical filtration usually takes place in the first stage or the first few stages, with the media for each stage getting progressively finer to filter out smaller particles. The wastes that frogs and other creatures living in the tank produce, as well as that produced by things like rotting plant leaves and other decaying organic matter, is removed from the water by friendly bacteria who need something to build their colonies on. That "something" is the media inside the filter. Without a filter, you have have very few or no beneficial bacteria in your frogs' habitat doing the vital work of removing the toxins in your tank from the water. I talk more about the water cycling process on this page, but for now, the important thing to remember is that the bacteria who do the work of keeping the water in your frogs' tank clean need a home, and that home is the filter media. Without a filter, you will have to work much harder to keep the tank water clean, and will have to do much more frequent water changes to remove toxins from the habitat. The bacteria responsible for biological filtration can colonize any of the media that perform mechanical filtration, as well as specialized, reusable media such as Seachem Matrix, ceramic rings or Bio Balls. Using reusable media helps maintain friendly bacteria colonies during filter cleanings and media changes. Seachem Matrix is my personal favorite because of it exceptional porosity and surface area. This kind of filtration is actually optional in a properly-cycled tank most of the time. Chemical filtration is the process of removing harmful chemicals that the friendly bacteria can't remove, medications that have run their course, or odors from the water. The most common media use for this purpose is activated charcoal, which can remove a wide variety of chemicals and odors from water by absorbing it into itself. There also are some more specialized chemical filtration media, such as Ammo Carb, which is used to remove ammonia from the water when it gets so high that it's causing harm to the creatures who live in the tank. There also are media such as Seachem De*Nitrate and Seachem Matrix that are designed to provide substrates for anaerobic bacteria to help remove nitrates from your water. This is sometimes necessary during the initial cycling process. In a fully-cycled and properly-maintained tank, absorbent media like activated charcoal, Ammo Carb, and Denitrate usually aren't necessary. But experienced aquarists usually keep them on hand "just in case." They generally should not be used during initial cycling, when the friendly bacteria will actually need the wastes in the water in order to populate the habitat. The exception is when the frogs are already in the tank and you have to do something to rapidly reduce the ammonia, nitrite, and nitrate levels. All of these media work by absorbing the chemicals into themselves, so they must be replaced when they've become saturated with tank pollutants. How often that is depends of the size of your filter and how polluted the water in the tank is. The most common types of filters for the small aquarium tanks that are suitable for African dwarf frogs are internal filters and hang-on-back (HOB) filters. I don't recommend either of them for a tank containing African dwarf frogs, however, for reasons that I'll get to in a moment. I'm mentioning them here just for the sake of completeness. As their name implies, hang-on-back filters hang on the back of the aquarium tank. Their intake siphon tubes hang inside the tank with their intake openings near the bottom of the tank. An electric pump built into the filter then circulates the water through the media and discharges it back into the tank. The filters need to be primed for this to happen, usually by filling them with tank water before starting them up. Also as their name implies, internal aquarium filters are placed inside the tank, usually by hanging them from a rear or side panel, sticking them to the glass with suction cups, or setting them on the bottom of the tank. I don't recommend them for ADF tanks. Another type of internal filter is the under-gravel filter, which is installed over the bottom of the tank before the substrate is added. These filters are powered by aquarium power heads, which are mounted on the inside of the tank and either pull the water down through the gravel (in the conventional configuration), or push it up through the gravel (in the reverse-flow configuration). Either way, I don't recommend them for African dwarf frog tanks (nor any aquatic habitat, for that matter). The main reason I don't like HOB or internal filters for African dwarf frog habitats has to do with vibration. ADFs don't have ears, per se. They have "lateral lines" on their bodies that are extremely sensitive to all kinds of vibrations. In nature, African dwarf frogs' lateral lines alert them to the presence of predators who want to eat them, so understandably they don't deal well with vibrations. Hang-on-back filters, internal filters, and the power heads for under-gravel filters all create constant vibrations inside the tank, which I can't help but believe will keep the frogs in a state of constant stress. That's the main reason I don't recommend them for ADF habitats. In the case of under-gravel filters, I simply don't like them. I used them in the past, and invariably they eventually got clogged up with detritus that couldn't be easily removed short of removing the substrate from the tank. The only kind of filters I recommend for tanks containing African dwarf frogs are external canister filters that don't need to be hung from the tank. These filters are basically cans containing media trays or cartridges through which the water is moved by an internal pump in the filter housing, or by a separate pump placed in the hose between the filter and the tank. The filters that contain their own built-in pumps are more common and popular. 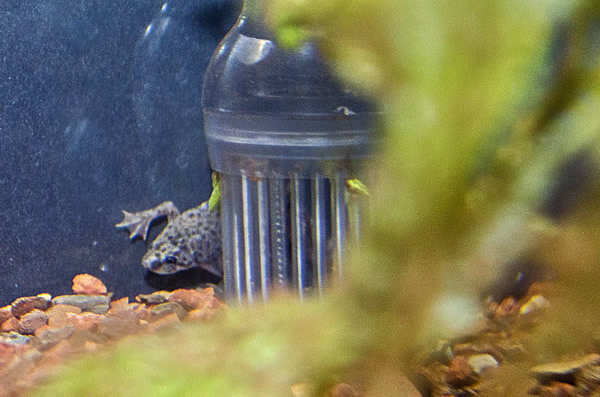 The biggest problem with using canister filters for the small tanks that are best suited to African dwarf frogs is that most canister filters are way too powerful. ADFs don't care for vibrations, but they're not real big on strong currents either. Using a pump with too high a flow rate will stress out your frogs just as much as the vibrations from a HOB or internal filter will. So when selecting a filter for an African dwarf frog tank, you don't want too high a flow rate. ADFs don't do well in strong currents. If you're on a really tight budget, one filter you should consider is the SunSun HW-603B canister filter. It's very inexpensive, has an adjustable flow rate, and has a maximum flow of about 106 gallons per hour. It's also reasonably quiet. On the down side, it doesn't have quick disconnects, which makes changing the media a bit of a bother; and it doesn't have media trays, so using any media other than the included foam sponges is very cumbersome. But if you're on a really tight budget and can't afford anything better, it'll do the job. Another filter that I like for ADF habitats is whichever of the Zoo Med Nano Series canister filters is rated for the size of your tank. The Zoo Med 511 Turtle Clean canister filter is another good choice for a small ADF habitat. They're basically the same design as the Nanos. Just don't use the hang-on-back strap. Remember, we're trying to avoid transferring vibrations into the tank. The KollerCraft TOM Rapids Mini Canister Filter uses an almost identical design to the Nano series and seems like it would also be a good choice for n ADF tank (although I haven't personally tested it). Another very good filter for a 10- to 30-gallon ADF tank is the Marineland-ML90749-Magniflow-Canister-Filter. It has just the right flow rate and is well-made. It's also the one I'm personally using these days. There are many, many canister filters besides the ones I mentioned above, and most of them will work just fine for an African dwarf frog tank. Here are some things you should consider when choosing a filter. Capacity rating. Be sure to select a filter that's rated for tanks the size of the one you're using or higher. Flow rate. A flow rate in gallons per hour of between eight and twelve times the amount of water is a good rule of thumb. So for a 10-gallon tank, a flow rate of between 80 and 120 gallons per hour should put you in the ballpark of what you need. Type of media. I like filters that have trays that I can fill with whatever media I like. I have multiple aquatic habitats, so I buy media in bulk and package it in filter socks rather than buying pre-filled media cartridges. It saves a lot of money. Amount of media. A lot of people get hung up on flow rates, but the actual amount of media in the filter is also important. More is better because it will have more carrying capacity and more surface area for beneficial bacteria to colonize. Cost of replacement media. If you'd rather have the convenience of pre-filled media cartridges, check to see how much replacement media for the filter will cost. Reputation. Check to see what other people think about the filter. If you're ordering from Amazon, read the reviews. I find they're usually very helpful. Whichever filter you choose, be sure to use an intake sponge of the proper size for your filter over the water siphon intake if there's even the slightest change that your frogs' feet could be drawn into the slots. It will also provide a bit of biological filtration and serve as a pre-filter keep bigger pieces of detritus out of the filter.